Some synths, such as u-he's Diva, offer lower quality settings that strike a balance between sound quality and CPU consumption. Today's computers are power-packed workhorses - multicore and multiprocessor workstations with enough juice for the most formidable tasks. Modern operating systems provide support for vast amounts of RAM, and new solid-state drive technology means that data bottlenecks are a rarity. The days of stuttering and artifact-infected audio tracks are long gone - or should be. The fact of the matter is that many producers, both amateur and pro, still manage to push that CPU meter into the red all too often. There are a couple of reasons for this: maybe you're saddled with an older machine for economic reasons; or maybe it's your workflow - modern productions can result in many dozens of tracks, each piled high with layers of effects and instruments, all adding to the processing overhead. Whatever the cause of that steam coming out of your Mac or PC, our nine tips will help guide you along the path to smooth, glitch-free sessions. Most of today's DAWs will allow for some kind of plugin delay compensation to ensure that any delays incurred by shuttling data in and out of the project (and your audio interface) won't cause an unwanted loss of synchronisation between processed and unprocessed tracks. In a pinch, you might be able to shut off this compensation during parts of the recording process when it isn't absolutely crucial. Some DAWs can likewise compensate for delays imposed by hardware effects processors. If you use outboard effects, consider printing them to a stereo track and shutting off any delay compensation that might be incurring further latency in your DAW's audio system. Are you using modular synthesizers in your work? Instruments like Reaktor, KarmaFX Synth and VAZ Modular are fantastic sound design tools, and their preset patches and user libraries are good resources for interesting sounds. However, open-ended instruments like these can be power-hungry, with an appetite for system resources that grows every time you add a module to a patch. Our previous tip can and should be applied to any synth, really. 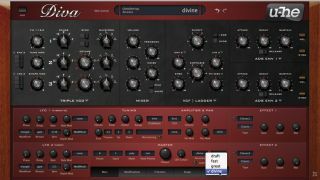 A synthesizer like u-he's Diva makes no apologies for trading CPU consumption for a stunningly authentic sound. But do you need every voice of polyphony on offer in the preset patch you're using? Can you shut off built-in effects on your synths? Many synthesizers (Diva included) provide various quality settings that offer a compromise between sound quality and CPU consumption. You can switch to a lesser quality while composing and working out your mix and then switch over to the high quality settings for a quick track freeze or bounce to audio once you've got the track where you like it. The best thing about recording at home may be the fact that we don't have to watch the clock. However, anyone who has ever recorded in a commercial facility will tell you that careful planning of the session is critical. Just because we don't have to be so meticulous about our methods doesn't mean we shouldn't bother. A bit of careful organisation and planning can prevent problems later on. Be aware of your system's limitations and work within them. Treat your system's resources as if they were as precious as an expensive hourly rate in a studio. It may not save you money, but it might just save your sanity! It may also force you to be that much more creative. We've already suggested closing any programs running in the background, but if you really must have access to your browser, do make sure it's closed down after any Facebook sessions. Some users report that Facebook can be a real glutton for CPU and memory, so close that browser or at least empty its cache before your session. If you're like us, your vocal tracks can be piled high with various takes, punch-ins, doubled tracks, tripled tracks and backing vocals, all with their own insert effects. Back when track counts were limited by the physical limitations of a studio's tape machine, engineers would bounce all of these tracks to a mono or stereo submix. This is still a good practice, making a song easier to get around during the mix. However, we'd recommend keeping the lead vocal separate to the backing vocals if possible. You can always keep the original tracks in the project in case you need to revisit them - just disable their effects and mute them. The above suggestion can be applied across the board for comped tracks and multiple takes, but you should also consider temporarily applying it to other groups of related tracks. For example, maybe you've got a rock project with a pile of individual isolated drum tracks - you could consider creating a consolidated stereo submix, deactivating the individual tracks until you really need them. Do you realise how many hardware devices are built into your computer? Do you need all of those things active at all times? What about that webcam? Hey Mac users, are you actually using Airport when tracking and mixing? Does that external drive really need to be connected while recording audio? These sorts of devices all require software that runs quietly in the background, and occasionally they can interfere with the smooth running of your setup - for instance, external drives automatically enter an energy-saving sleep state when not used for a while, and they can cause your system to lock up for a second or two when they 'wake up'. Not good when you're trying to lay down a recording! If you're experiencing issues like this, try temporarily disabling such devices while working on music. Deferred Procedure Calls, or 'DPC' can give the hapless Windows-based desktop producer much grief. A DPC is a function by which a high priority task (like an interrupt handler) will make a lower priority task wait while it does its thing. This can be a real pain if, say, your Ethernet adapter, modem or onboard sound adapter are considered a higher priority than your audio interface. Bad drivers can also put your audio interface second place in the cue. Not cool. Luckily, you can use LatencyMon to clue you in to the execution times of the drivers on your system. Be warned, though, this isn't for those looking for a quick or easy solution. Still, it can tell you what's going on under the hood, and you can take the necessary steps to set things right, such as reinstalling drivers, rolling back to older drivers, or simply knowing what needs to be shut out or replaced.